If your horse walks you and not you walk the horse, if you have to back up when your horse gets near you, then you have not yet earned your horse’s respect. Your horse may love you and nicker when you are approaching. But, that your horse respects you is a whole different deal. Remember, that whatever you do with your horse from the ground, the horse sees it as if you were even on his back. Respect on the ground transfers to respect on their back. It took me a while to accept this. Experience over and over again convinced me of this truth. 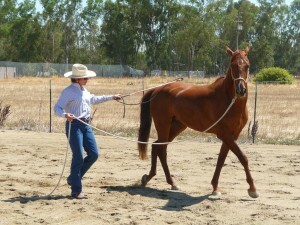 When you start to lunge your horse (or do the circle game) do you have to back up a few steps to get the horse on his way? Then your leadership is now compromised. 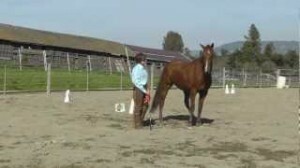 Make your horse take the few steps backward to get going in the circle. I guarantee that your horse will be more willing to pay attention and do what you ask. Your personal space is YOUR PERSONAL S P A C E. If you don’t respect it,you cannot expect your horse to treat it with reverence either. Another truth to take to heart: You have the liberty to approach your horse at any time. Your horse does not have the liberty to invade your space whenever he/she feels like it. Whether in human or animal relationships, respect is earned. You have to politely, yet firmly, act in a deliberate manner that demonstrates that you are worthy of respect.